A few months ago, my manager tasked me with setting up automated monitoring and alerting of replication for the virtual machines on our Microsoft Hyper-V Server 2012 R2 (core) hypervisor servers (a task that I was more than happy to accommodate considering I had been meaning to anyway and I love programming but, unfortunately, it's rarely a part of my job) and IM-ed me "http://luka.manojlovic.net/2015/03/05/simple-hyper-v-replica-warning-critical-state-notification/". I appreciated the starting point but I despise alerting via email because it's a nightmare to manage. Our Remote Monitoring and Management (RMM) system, MAX RemoteManagement, is integrated with our helpdesk / Professional Services Automation (PSA) system, Autotask. 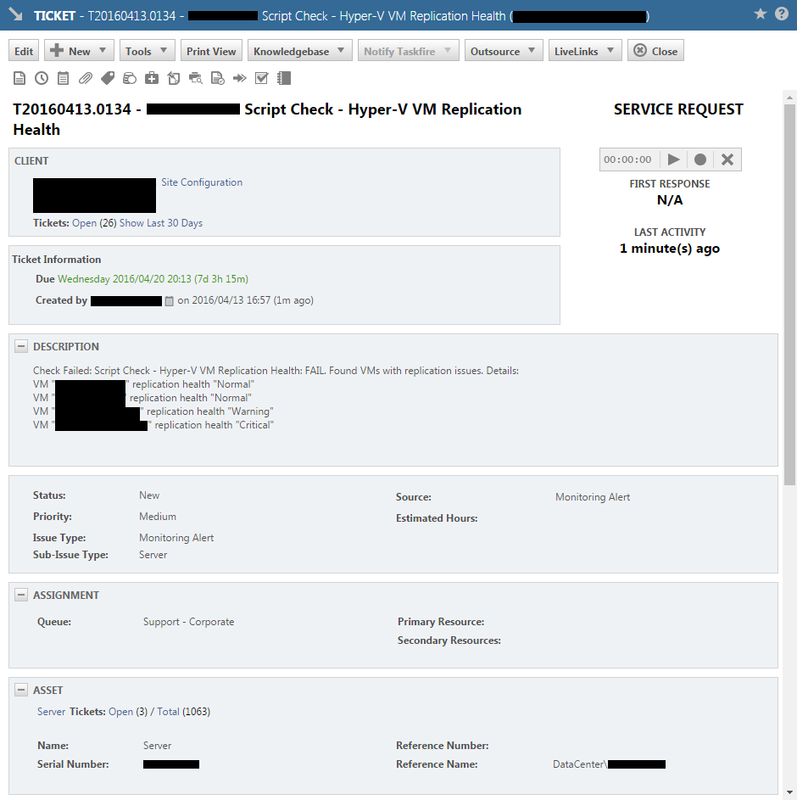 The main benefit of this is that if the RMM system detects an issue then in the PSA system it automatically creates a ticket containing the details, etc. Obviously, it made infinitely more sense to make use of this so I decided to look into it. Which scripting languages are supported? For a check to be reported as passed or failed, what return codes should be returned by the script? 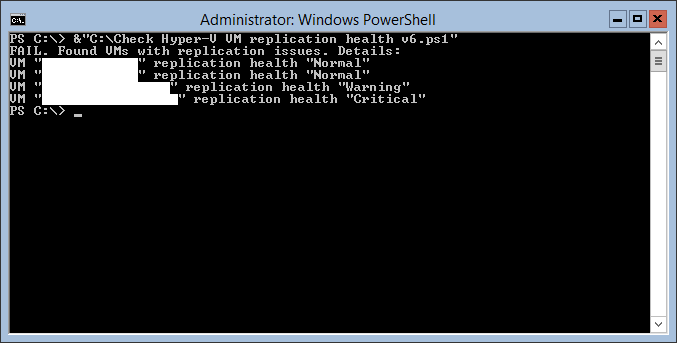 So, this suggested that I should simply be able to use a PowerShell script to check the VM replication health and return the appropriate exit codes. Obviously, I'm not going to waste my time creating a PowerShell script to accomplish a task if one already exists so I browsed the web looking for one that I could modify to our needs but I didn't find much and what I did find either wasn't suitable or I wasn't satisfied with. (Hence, this post). Quickly, I got a crude-but-functional system working but over the next few months I noticed pitfalls and issues so I regularly refined and adapted it. 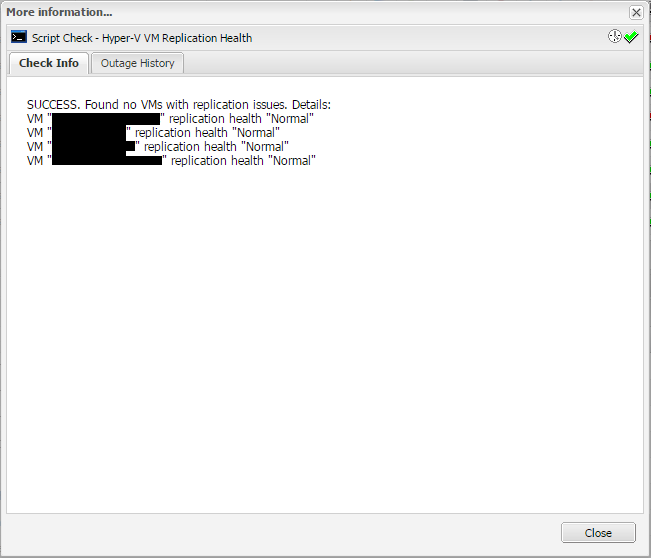 A few months later, I give you "Check Hyper-V VM replication health v6.ps1".